Will Italy and Poland be able to update the German-French leadership of the EU? Italy has called on itself and Poland to be an opposition to France and German leadership in the EU as France and Germany sign deals to tighten bonds. Following a conference in Warsaw in mid-January, Italian deputy prime minister Matteo Salvini and his counter-part Joachim Brudziński stated their intentions for the creation of an Italo-Polish axis to "counter the Franco-German axis." The Five Star movement and the League Alliance in Italy and the Law and Justice party (PiS) of Poland are both Eurocentric populous parties that swept the last election cycle. This new coalition could pose a threat to the current Franco-German axis that has been the core of the EU since its founding. In the European Parliament, each country is given a proportional number of representatives based on their population. France and Germany combined have a total of 170 of the 751 total representatives, while Italy and Poland have a total of 124. However, only 15 MEPs for both Poland and Italy are from a Eurocentric party, the Europe of Freedom and Direct Democracy (EFDD). Though elections are due to be held in May of 2019 and the wave of populism seen in the recent elections, parties like the EFDD could see large gains across Europe. But currently, Italy and Poland do not have enough power to strongly affect legislation in the European Parliament, with only a few Eurocentric members in Parliament and the fact that members vote almost solely with their party and not on country lines. When it comes to Largest GDPs of the EU countries, Germany is the largest and France is the 3rd largest, soon to be 2nd with the UK leaving the union. 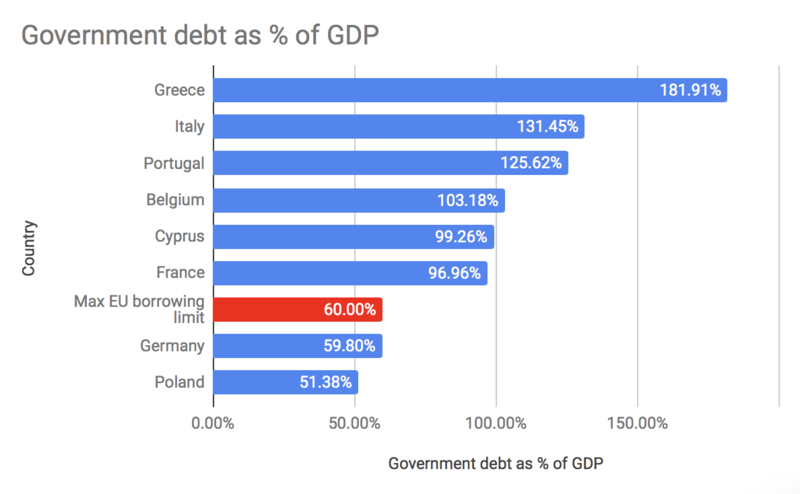 Italy is 4th, but has a large amount of debt and has clashed with the EU over their most recent budget, ignoring the rules put in place following the 2008 financial crisis. Poland comes in 8th but only makes up around an 8th of the entire German GDP. In terms of economic power, Italy and Poland currently cannot compete with France and Germany. Much like GDP, when it comes to funding, Germany and France make up a majority of it, together contributing more than 42,749 million Euros. While combined Italy and Poland contribute 17,492 million Euros to the annual European budget. All this while the two together receive 22,229 million Euros annually. In terms of both GDP and total contributions to the European Budget, Poland and Italy do not compare to the Franco-German axis. And then comes politics. Italy is a large player in the European Union but has fought recently with European Commission (EC) over their most recent budget. Italy has refused to compromise with the EC borrowing more than allowed by EU rules. Italy also exceeds the maximum borrowing limits of the EU, borrowing more than 141% of GDP, more twice the limit of the EU. This has caused tension between the EU and Italy, with many believing that Italian banks are still weak from the 2008 crisis and may be unable to survive another crisis, and if they fail Italy is too big to bail out. Poland, on the other hand, is seen as a rising economic power in the EU, the only EU country to avoid the 2008 global recession. In terms of projected economic growth, Poland could become a key player in the future of the EU. However, ever since the PiS party came to power in Poland, the European Community has been critical of many actions taken by this new populist, Eurocentric party. Following the judicial reforms of the party, the EU triggered article 7 on the country, a process that could end with Poland being stripped of their voting rights in all matters of the EU. Article 7 is a very serious matter, with this being the first time it has ever been triggered and can only be triggered when a member state has been found to be continually breaching the core values of the EU. Both Germany and France have a proven track record in steering the EU. Merkel dealt with both the refugee crisis and the Eurozone crisis. Even with Merkel leaving, the most likely replacement will either be Macron or her replacement as leader of the Christian Democratic Union (CDU): Annegret Kramp-Karrenbauer and probable next chancellor. Macron has a less proven track record, however, he has been an avid supporter of European integration and a joint European Army, however, it will be hard to fill the shoes of Angela Merkel, and Macron is not as tested as his German counterpart. The Italo-Polish axis cannot compare to the already established Franco-German axis in terms of economic power, voting power, and political power. Perhaps one day Italy and Poland will be able to rival the current leadership, but only after an improvement in both economic and current political aspects. Even with Merkel stepping down, the Franco-German leadership does not face any real challenges for a replacement coalition.